The LED lighting display by Philips Lighting is expected to lower energy consumption by 50%. 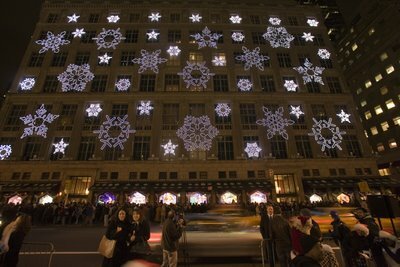 Each year, luxury retailer Saks Fifth Avenue displays its Snowflake Spectacle–a high-tech light show that combines holiday tradition and advanced technology. Philips has replaced this year’s snowflake design with 40,400 newly upgraded LEDs (light emitting diodes) to make this year’s spectacle the brightest and most energy-efficient ever. This year’s Spectacle will use only 2600W of energy, the equivalent of just three toaster ovens. 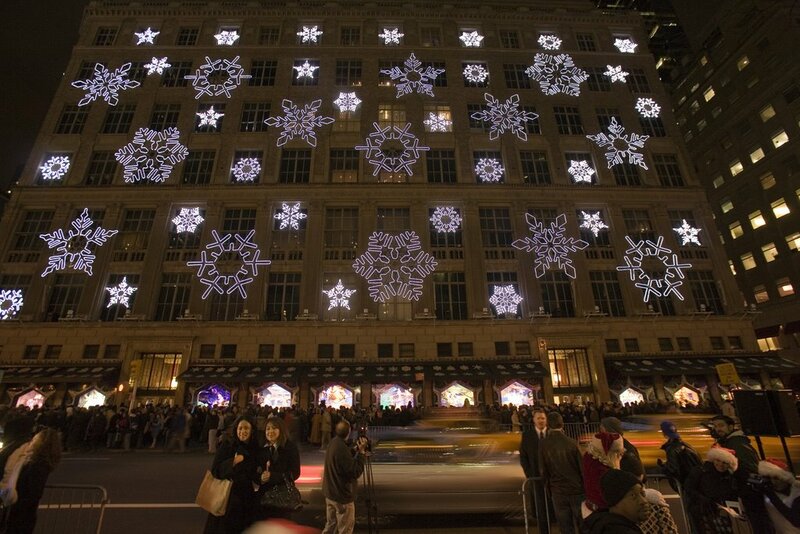 Philips, which lights many of the world’s preeminent landmarks including The Eiffel Tower, The Sydney Opera House, Buckingham Palace and The Sphinx, is providing more than 40,000 LED lights that when illuminated, will give the effect of snowflakes falling and dancing across the façade of the Fifth Avenue store every fifteen minutes during the Holiday season. The Philips Lighting technology featured on the Saks Fifth Avenue exterior will also appear in the building’s 28 surrounding windows. Representations of the snowflakes will also appear in all 54 Saks Fifth Avenue stores nationwide, as well as online and in the Saks holiday catalog. * 50 fully programmable snowflakes reaching 10 stories high (36 8’ and 14 20’) inspired by William “Snowflake” Bentley’s snowflake photos from the 1920s. * The bright LED lights used to illuminate all 50 snowflakes consume only 2600W–the energy equivalency of only three toaster ovens. * The project required 40,400 LED modules, strung at a length of 13,480 feet, or 2.55 miles, to cover 36 eight-foot diameter and 14 twenty-foot diameter snowflakes. * Placed end to end, the lights measure more than the length of 4.5 football fields. * The size of each LED that helps to form the snowflakes and emits light is less than the size of a pin head. Next articleFM Frequency: Giving Thanks!